Hawaii starting senior cornerback Turmarian Moreland's season and UH career might be over after a knee ligament injury Saturday. Moreland left UH's 50-23 victory over Utah State at Aloha Stadium in the first half after he was blocked low on a running play. "I knew he was hurt pretty bad when he didn't get up," UH defensive backs coach Rich Miano said. Miano and head coach June Jones said team doctors told them Moreland appears to have suffered a torn MCL, which probably won't require surgery. But the injury requires six weeks of rehabilitation at the very minimum and UH's last game is Dec. 3 against San Diego State. It is similar to the injury suffered by UH safety Leonard Peters against USC on Sept. 3; Peters returned to practice last week but is not expected to play this season. "Turmarian may be out and that's too bad," Jones said. "The last few weeks he was playing very good. He probably won't need surgery, but we'll find out (today)." Moreland leads UH with four interceptions and is tied for sixth in the nation with .50 picks per game (Moreland did not play in two of the Warriors' 10 games). He has 26 tackles and is tied for second on the team with three pass breakups. Sophomore Ryan Keomaka replaced Moreland on Saturday. He was in on four tackles and broke up two passes. "He made the plays," Miano said. "He's got some potential. If he tunes into what we're doing, he can be a good player." Miano said safety Lamar Broadway might move back to cornerback, and converted receiver Andre Taylor will get a look, too. The injury news regarding starting defensive end Mel Purcell is better. Purcell suffered a hyperextended elbow Saturday, but it is a recurrence of an injury he was able to play through before. "Luckily we've got a bye, so hopefully after a week it'll settle down, we can put a brace on it and he can go play," Jones said. "Mel played extremely well Saturday." Moreland and Purcell both underwent MRI exams yesterday. The results were expected to be available today. Bess among the best: UH freshman receiver Davone Bess is playing himself into All-America consideration. He caught five passes for 110 yards and two touchdowns in around three quarters of play Saturday. Bess leads the Warriors with 81 receptions, 1,048 yards and 12 touchdowns. Nationally, he ranks third in receptions per game with 8.1 and sixth in receiving yards per game with 104.8. Bess is tied for fifth in total receiving yards and receiving touchdowns. He is the top freshman in the nation in all four categories, and is within range of breaking the records for freshmen. "I see him deserving to be listed as one of the best in the country," Jones said. "I have not had a player have as much impact on a team and make the plays he does." Bess ran back one punt for 3 yards on Saturday as a warm-up for UH's next game, Nov. 25 against Wisconsin, when Bess will be the Warriors' primary punt returner. "He's our best athlete and he can change things in a game," Jones said. If Bess gets All-America recognition, he would be the third UH receiver in five years to do so. Ashley Lelie was third-team in 2001, and Chad Owens was named second-team all-purpose last year. Bess in on pace to break Owens' single-season record of 7.84 receptions per game set last year. "He's very similar (to Owens)," Jones said. "He's quick like Chad, but stronger through the break point. He has a good understanding after one year of what we're doing. He's a gamer, turns it up in the game. "Then there's his work ethic. Before the sun comes up, he's out there at 6:15 waiting for practice. He's got what it takes to be the best." Another UH freshman, Ryan Grice-Mullen, is 14th in total receiving yards with 922 and 21st in receptions per game with 6.4. 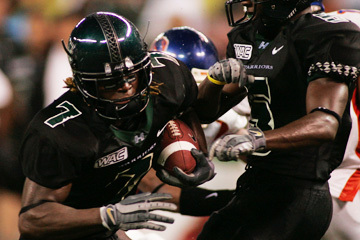 Davone Bess of Hawaii is the only freshman among the nation's statistical leaders in pass receptions and yardage. Sacks (No.-Yds. ): Kamakawiwo'ole 8-62, Alama-Francis 5-25, Moe 2.5-9, Elimimian 2-10, Broadway 2-10, Manners 2-8, Noa 1-7, R. Fruean 1-5, Kalilimoku 0.5-4. Total: 24-140. Interceptions (No.-Yds. ): Moreland 4-26, Porlas 1-22, Elimimian 1-6, Patton 1-0, Manners 1-0. Total: 8-64. Fumbles (Total-Forced-Recovered): Kamakawiwo'ole 4-3-1, Alama-Francis 3-2-1, Manners 3-2-1, Curnan 2-1-1, Kalilimoku 2-0-2, Patton 1-1-0, Moreland 1-1-0, Purcell 1-0-1, Moe 1-0-1, Cox 1-1-0, Paepule 1-1-0, Dickerson 1-0-1, TEAM 1-1-0. Total: 22-13-9. Blocked kicks: Akpan, Patton, Alama-Francis.